I just love the Drapery Fabric ( Scalamandre Silk with tri-colored Silk Tassle Fringe). When my client saw my Window Elevation Drawing of the Drapery, she wasn't quite sure, however, she trusted my judgement and her bedroom has become her favorite room. Unfortunately, it is hard to see the fabulous details of the Gold-Leaf Mirror...it is spectacular !!! The hand carving is so beautiful and the geese at the top, about to take flight ,are magnificent. Lamps were found in my travels...they were 18th Antique Rose Medallion Chinese Porcelaine Vases that I had mounted and electrified. 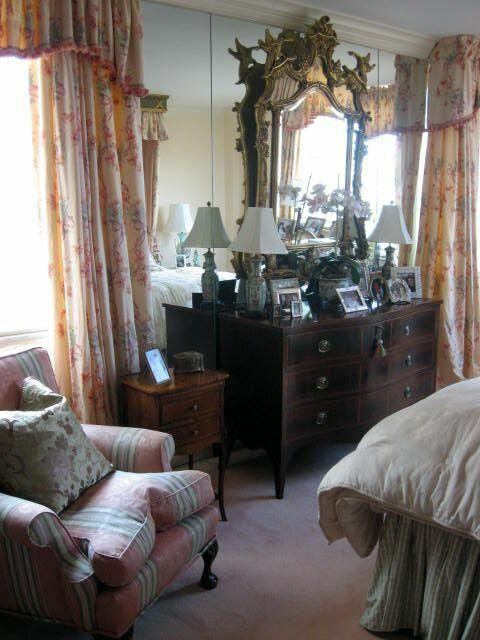 Furniture is English 18th Century Antique ( repro of 18th Century Sheraton / Hepplewhite Period ). Please note the finely finished Mahogany Dresser which is accented by delicate Satin-Wood banding and inlay. Chair is Antique English Ball-n-Claw which I had re-sprung and down-filled.